Title companies offer one of the most important types of insurance that one can buy. For most people, a residence or commercial property may be the most expensive asset they own. Title insurance in a real estate transaction has great value to the average consumer. Think about it this way, what is the first thing you do when you go buy a car? You probably (hopefully!) pick up the phone and call your insurance agent to insure the vehicle. So naturally, insuring your real estate would be more pressing, since the value of it can be quite substantial. So what should a good title company offer? Since the Ohio Department of Insurance regulates title insurance in the state of Ohio, and the Ohio Title Insurance Rating Bureau dictates all premiums, a title company can set itself apart by the customer service they offer along with the partner networks they share. Working with a large title company that does business on a national level has many advantages. Title companies with the ability to write on multiple underwriter paper have the ability to provide more options and flexibility to their clients. For instance, Title First Agency is licensed in 33 states and can conduct business in all 50 states through its partner network and affiliations. Title First utilizes five of the leading title insurance underwriters in the business to issue title insurance policies to end consumers. (Check them out at https://titlefirst.com/underwriters/) This benefits the consumer in many ways, especially when a potential title issue arises and one underwriter is willing to take the risk while another may not be so willing. Another benefit of a national title company is the increased level of protection of private information of both clients and consumers. There is a vast amount of private information necessary in conducting a real estate transaction. Some title companies have specific protocols as well as various checks and balances in place to ensure consumer privacy, which is paramount in today’s world. At Title First, we pride ourselves on achieving the highest certification for cyber security audits, without exception, known as SSAE 18. In addition, Title First is Best Practices Certified by the American Land Title Association. In order to obtain these certifications, Title First has participated in rigorous, outside, third party audits that test our systems and ensures the company maintains privacy at every level. What does this mean for you and your clients? It means that you can rest easy knowing your client’s information and financials are safe within our company. 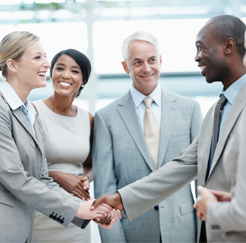 Larger, national title companies, such as Title First, have a strong network of contacts in the real estate industry. Whether it be lenders, national vendors, realtors, or private attorneys – national title companies have access to all of these partners and more, which provides consumers and clients with access to any resources they may need during their transaction. This access creates the best overall experience at the closing table for the consumer and their realtors! Some lenders will only work with certain title companies – some have a “preferred vendors” list. Title First has built these affiliations and relationships over more than 60 years in the business. A trusted partner can provide you with peace of mind so you can make it to your next listing appointment or showing, on time and without a worry. Why not use a company with a proven history, and a large network of providers to ensure you get the most for your client? Title First does just that – “National Reach, Local Touch” – at every step of the way. By: Angie W. Sherry, Esq. Previous Previous post: Do I Need Title Insurance?